Is It Safe to Buy Deere & Company Stock? 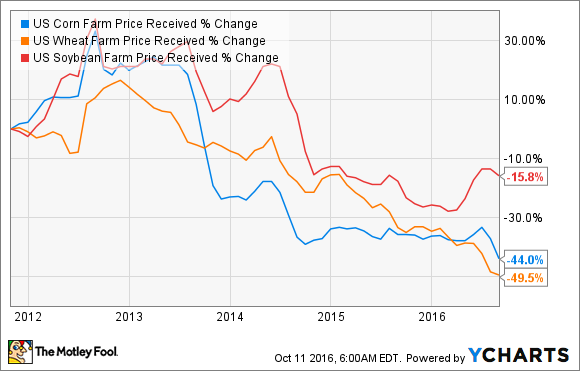 A look at the underlying trends in the agricultural machinery company's trading. Deere & Company's (NYSE:DE) end markets (agricultural and construction machinery) haven't improved in 2016, and its EPS is down 16% in the first nine months of its fiscal 2016. 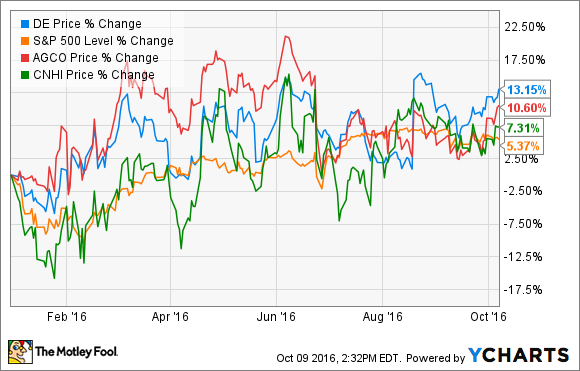 However, the stock is up 13% year to date, having outperformed the S&P 500 and peers like AGCO Corporation (NYSE:AGCO) and CNH Industrial N.V. Most of the move took place immediately after the company trumped estimates with its third-quarter results. So, does this mean the company is now through the worst, and the stock can take off from here? Let's start by looking at the tale of the third-quarter results. On a headline basis, the results were good and indicated that Deere is doing a good job of managing a difficult environment. Guidance for net income attributable to Deere & Company of $1.35 billion compared to the previous forecast of $1.2 billion. Cash flow from operations 2016 guidance maintained at $2.1 billion. Consolidated trade receivables and inventory is now expected to decline $550 million (in constant currency) compared to a previous forecast for $475 million -- which is good, because when a company's sales are falling, it will need to reduce inventory and increase cash flow. Clearly, the market liked the headline figures and guidance, but is everything as rosy as it seems? Let's look at the pros and cons. Deere & Company needs crop prices to rise so farmers start spending again. Image source: Getty Images. On the positive side, it's obviously a good thing that guidance for full-year net income was increased by some $135 million. Moreover, management confirmed expectations for price realization of 1% for the full year -- important because it implies Deere still has some pricing power despite falling sales and pressure to reduce inventory. In another positive sign, AGCO Corporation CFO Andrew Beck also plans for "price increases of approximately 2% on a consolidated basis" for 2016. Deere is also managing its inventory position well. Manager of Investor Communications Joshua Jepsen said on the third-quarter earnings call: "Field inventory-to-sales ratios for new large Ag equipment are expected to end the year in line with 2015 year-end levels, which is consistent with our previous forecast." Putting these points together, Deere is managing its inventory position well, while even achieving price increases within a difficult trading environment. On the other hand, none of the underlying issues affecting Deere's trading environment have gotten any better. First, prices of key crops such as corn, wheat, and soybeans remain at depressed levels, and AGCO's Beck outlined that "the USDA estimates the farm income will be down again in 2016 and as a result" -- farmers income is the primary factor behind new agricultural equipment sales. Second, Deere's own full-year sales outlook was actually taken down in the third quarter. Deere's agriculture and turf net sales are still expected to decline by 8%, with construction and forestry net sales now expected to decline 18% compared to previous guidance for a fall of 13%. The end result is that Deere's guidance for full-year net sales was lowered to a decline of 10% compared to a previous estimate for a 9% decline. Third, Deere is doing a good job of managing its inventory, but pressure continues to build. One particular concern relates to the growing amount of equipment on operating leases on Deere's balance sheet. As farmers are unwilling to make outright purchases of equipment, they have shifted to leasing equipment. The tricky things is when the leases are up and the equipment hits the used-equipment market: If a glut occurs, it could pressure new-equipment prices. As you can see below, Deere's equipment on operating leases continues to grow even as equipment sales decline. Image source: Deere & Company presentations. In addition, Director of Investor Relations Tony Huegel answered a question on leases, saying, "We'll hit some pretty strong maturities in the fourth quarter of this year, and then certainly as we move into spring, you know, next year is I think another kind of wave of maturity." Fourth, the $135 million increase in full-year net income guidance is partly due to a $75 million benefit from the sale of partial interest in a landscape supply company. Meanwhile, the full-year effective tax rate is now expected to be 29%-31% compared to a previous estimate for 31%-33%, and selling, administrative, and general expense costs are expected to decline 5% instead of a previous forecast for a 4% drop. According to my back-of-the-envelope calculations, all of these factors add up to the $135 million increase. Safe to buy Deere & Company stock? Only if you have a strong view on crop prices increasing. Deere is doing a good job, but pressure continues to build on its inventory position, and given the upcoming leases expiring, it might be a good time to be cautious about buying the stock. The headline numbers in the third-quarter earnings report were good, but the underlying picture remains challenging.